After weeks of struggling, Arrow hit its endgame this week with about the same level of grace as a runner crossing the finish line at the end of the marathon—wobbly, strained and completely exhausted. Things begin well enough. As expected, Team Arrow wakes up in their jail cell seemingly unharmed by the Alpha-Omega gas that was distributed into the area. Malcolm informs the rest of the crew that, yes, his betrayal was part of his and Oliver’s convoluted plan to gain Ra’s’ trust in order to destroy the League from the inside. Again, Felicity serves as audience surrogate by acknowledging that she’s losing track of all the double and triple crossing. What’s more, Malcolm has developed an inoculation to the chemicals and he has apparently been slowly inoculating the others over the past few episodes. Seems kind of like a major cheat, which is the first sign of the more problematic aspects to come. Just then, the group is recognized by none other than—ta da—Grant Gustin’s Flash! What initially appears to be the making of an awesome team-up episode, however, soon is revealed to be little more than a cameo, as Barry announces he needs to have a “pointed conversation with Harrison Wells.” In the end, all this appearance really does is remind me how much more consistent and fun The Flash has been this season, when compared to its big brother series. Adding to the fuel, after being rescued, Tatsu decides that she must return to her life of solitude instead of helping Oliver. So, essentially, Arrow introduced both Katana and The Flash this episode only to have them play no part in the actual final battle? Weak. Meanwhile, on the plane ride to Starling City, Oliver reveals his true intentions when the aircraft’s mechanics start malfunctioning. Unfortunately, Ra’s escapes with the Alpha-Omega. Oliver subsequently meets with Team Arrow back at the base and tells them that his primary plan—to crash the plan before it gets to Starling City—failed and they must now work together to stop Ra’s from spreading the Alpha-Omega on the ground level. Moreover, it quickly becomes apparent that Oliver was willing to die in the plane if his initial plan had worked. This only adds to the flames of distrust between Oliver, Diggle and Felicity. In the end, however, Felicity’s anger isn’t so substantial that she doesn’t give Oliver some heart-to-heart encouragement before he heads into battle. Long story short—Team Arrow prevents Ra’s men from destroying the city, Oliver slays Ra’s in a fairly underwhelming sword fight and Felicity ends up rescuing Oliver from being shot off a ledge by picking him up in the ATOM outfit. 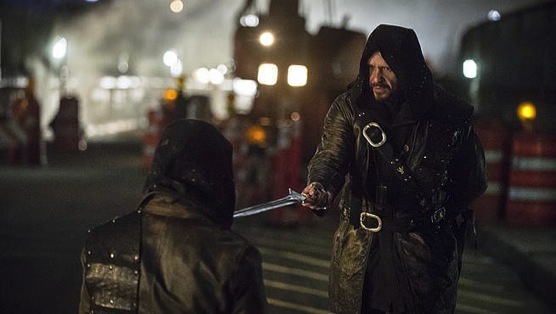 Watching this climax, it’s hard to believe that this is the same show that gave us such phenomenal, action-filled finales such as “Sacrifice” and “Unthinkable.” I don’t know if the show was saddled with an enormous budget cut this season, thus making it harder to achieve its traditional epic feel, but “My Name is Oliver Queen” ends up coming across more as a glorified afterthought than a proper conclusion. One could definitely argue that the finale is attempting to be more character-focused than plot-focused, which would be admirable if the character dynamics this year—from the contrived divisions in Team Arrow, to Felicity becoming defined by her relationship with Oliver—didn’t appear to stem more from plot convenience than organic character growth. With Ra’s out of the picture fairly early, the episode’s remaining ten minutes basically sets the pieces for next season. Malcolm is appointed the new Ra’s al-Ghul and a furious Nyssa must now bow to him (guess that friendship with Laurel went nowhere, as it’s not even addressed here). Diggle quasi-reconciles with Oliver while still keeping his distance, Thea officially dons Roy’s Arsenal attire and is dubbed “Speedy” and Ray is seemingly caught in a big explosion while trying to modify his suit (but he’s in Legends of Tomorrow so he’ll be back). Finally, unable to retain The Arrow identity, Oliver decides to relinquish his superhero duties to the rest of Team Arrow and drive off into the sunset with Felicity. Oliver’s metamorphosis into a regular citizen is paralleled with the Hong Kong flashbacks, which depicts his transformation into a cold-blooded killer. Following the death of Akio, Oliver begins questioning the commanding officer they’ve taken hostage. When he refuses to talk, Oliver fills him with arrows and Maseo acts as an angel of mercy by shooting the man in the head. Realizing he cannot return home this way, Oliver decides he must be alone for now. What leads him to the point where he seeks rescue in the pilot episode will, I suppose, be the focus of next year’s batch of flashbacks. This contrast between a damaged Oliver seeking the path of solitude and the present-day, reformed Oliver who is surrounded by allies is a good one in theory. As a whole, it doesn’t really work well enough to justify many of the Hong Kong flashbacks, which lacked a character as compelling as Slade to elevate it beyond mere filler. That being said, I feel it’s also my job, as a fan of the show, to point out when I feel its aim has gone askew. Arrow’s third season, as a whole, was a series of quality-based starts and stops, with the show hitting its biggest creative peak around the mid-season finale, around the time of its crossover with The Flash. In the end, it’s all too telling that one of the most memorable lines in the episode is a Whedon-level meta-crack made by Quentin when he’s told about the oncoming assault. “The city’s under attack?” he asks before sarcastically quipping, “must be May.” Here, the creative team appears to be showing their hand. This finale exists not because it’s the ultimate, natural culmination of the story they’ve built up all year, but because it’s May and the finale deadline was approaching. Certainly, producing this many hours of television with so many logistical issues is no easy task. Considering that the Arrow creative team has also been somewhat split in half in the wake of The Flash, a dip in quality during this transition was to be expected. Here’s hoping they manage to rekindle their creative flame for next year.